Everyone is excited since it's that time of the month! ATLANTICA DAY has arrived! 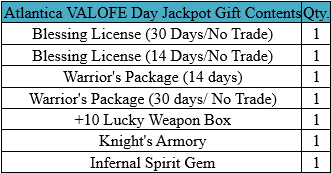 Aside from the Gift Boxes, you can get the [Atlantica Day Coupon] for every hour that you are online. The number of coupons will increase per hour and everyone can earn up to 6 coupons and a Honey Jar Key! These coupons can be exchanged for weapons to the Atlantacong NPCs located in Rome! Get items on specific times, be sure that your character is online! 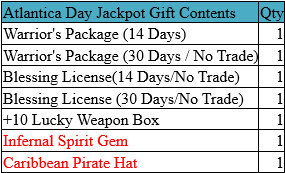 Atlantica Day Item Mall Sale! Exclusive offers available only for the week! See you guys soon and have a great weekend!